According to El Niño–Southern Oscillation (ENSO) energetics theory, the work done by the wind on the ocean, known as wind power, has a strong forcing relationship with ENSO sea surface temperature (SST) changes, wherein negative (positive) tropical Pacific wind power anomalies contribute to warm (cold) ENSO events. The ENSO energetics framework assumes a mean state characterized by easterly winds, westward currents and a thermocline shoaling from west to east such that positive zonal wind power anomalies will induce a La Niña state and negative anomalies will induce an El Niño state. 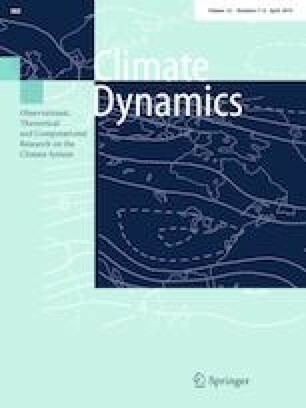 In this study, tropical Pacific wind power is computed using satellite data and its correlations with Niño 3.4 SST anomalies evaluated and compared to the conventional dynamical predictors, namely warm water volume and wind stress. Analysis of the spatial and temporal structure of climatological wind power and its variability during individual ENSO events reveals sign inconsistencies in which certain wind power anomalies (e.g. those associated with westerly wind events in the far west) are positive despite forcing the system towards an El Niño state. These results show that the conventional ENSO energetics framework makes assumptions about the climatological state that are not always consistent with observations. We apply sign adjustments to the computation of a tropical Pacific wind power index that include the directional aspect of the wind power perturbations and find that these adjustments greatly enhance the lead correlations between wind power and Niño3.4 SST anomalies, which are now comparable to conventional dynamical predictors. This research is supported by Grants from the National Science Foundation (NSF) (AGS-1613318 and AGS-1338427), National Oceanic and Atmospheric Administration (NOAA) (NA14OAR4310160) and National Aeronautics Space Administration (NASA) (NNX14AM19G). N.J.B. is support by the Alfred P. Sloan Foundation as a Research Fellow. The OSCAR data were obtained from JPL Physical Oceanography DAAC and developed by ESR. GODAS data were provided by the NOAA/OAR/ESRL PSD, Boulder, Colorado, USA, from their Web site at http://www.esrl.noaa.gov/psd/.HadISST1 data were provided by the U.K. Met Office Hadley Centre at https://www.metoffice.gov.uk/hadobs/hadisst/. The TropFlux data is produced under a collaboration between Laboratoire d’Océanographie: Expérimentation et Approches Numériques (LOCEAN) from Institut Pierre Simon Laplace (IPSL, Paris, France) and National Institute of Oceanography/CSIR (NIO, Goa, India), and supported by Institut de Recherche pour le Développement (IRD, France). TropFlux relies on data provided by the ECMWF Re-Analysis interim (ERA-I) and ISCCP projects.